What Does the Community Engagement Core (CEC) Do? 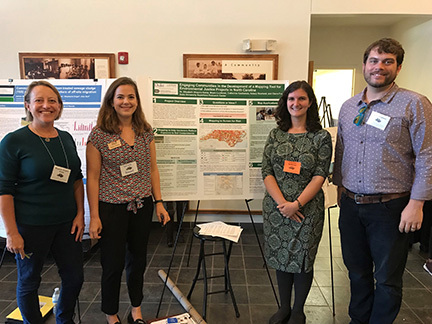 Community Engagement Core staff (L-R: CEC Director Elizabeth Shapiro-Garza, MEM student assistant Kelsey Rowland, CEC/RTC Program Coordinator Catherine Kastleman, and RTC/CEC Senior Program Coordinator Bryan Luukinen at the North Carolina Environmental Justice Summit in October 2017. The Community Engagement Core works with communities across North Carolina affected by environmental contaminants, especially those related to early life exposures to chemicals that may have later-life impacts. Communities can contact us with short-term requests for information related to environmental contamination or with proposals for longer term engagement through participatory research projects and/or education and outreach activities. By “community engagement,” we mean working in an ongoing way with a community, listening closely to their needs and learning from their experiences. In 2016, the RTC initiated a community-based participatory research project to understand and reduce exposures to soil contaminants, including pesticides, in garden soils. 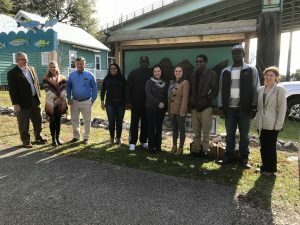 We are partnering with North Carolina Community Garden Partners, the Environmental Protection Agency, and the North Carolina Cooperative Extension, among others. 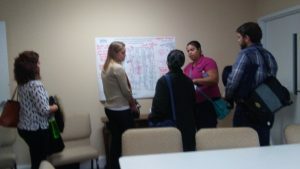 In addition to creating an exposure map tool for gardeners, the project involves qualitative research through site visits, interviews, and focus groups that will eventually inform a social marketing campaign to positively influence gardener behavior and management choices that reduce contaminant exposure. See more about the project at our community gardens project page (sites.nicholas.duke.edu/superfund/gardens). 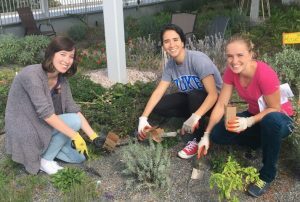 Students from the Nicholas School of the Environment’s Master of Environmental Management (MEM) program (L-R) Reilly Henson, Sofia Tenorio Fenton, and Elissa Tikalsky take soil samples from the Nicholas School’s rooftop garden. The CEC is partnering with communities in close proximity to former industrial sites to investigate potential exposure to industrial contaminants and to build community capacity for preventing and reducing exposure. We are helping communities to gather information and conduct research to inform decision-making, and connecting them with expert networks and resources. In addition to these projects, we are interested in hearing from communities about any other topics of concern to communities who want to learn more about environmental contamination. We are often able to provide short-term assistance and community engagement support. Please feel free to contact us at SuperfundCEC[at]duke.edu. For more information about our community engagement efforts, contact SuperfundCEC[at]duke.edu. Kastleman C., Shapiro-Garza E., Luukinen B. “Resources for NC Community Gardeners.” NC Community Gardens: Soil Contaminants and Pesticides. Published January 2018. Website URL: sites.nicholas.edu/superfund/gardens. Shapiro-Garza E., Kastleman C., Luukinen B., Henson R., Tenorio Fenton S. and Tikalsky E. “Executive Summary: Understanding Pathways to Contaminant Exposure in North Carolina’s Community Gardens.” May 2017. Available at http://sites.nicholas.duke.edu/superfund/gardens/. Shapiro-Garza E., Kastleman C., Henson R., Tenorio Fenton S. and Tikalsky E. “Community Gardeners and Soil Contaminants.” May 2017. Available at http://sites.nicholas.duke.edu/superfund/gardens/. Shapiro-Garza E., Kastleman C., Luukinen B., Henson R., Tenorio Fenton S. and Tikalsky E. “Video Presentation: Soil Contaminants in Garden Soils.” May 2017. Available at http://sites.nicholas.duke.edu/superfund/gardens/. Kastleman C., Shapiro-Garza E. Choosing Safer Fish from the Northeast Cape Fear River. Oral presentation, Meeting at Cape Fear River Watch with US EPA, NC DEQ, community members, and local health officials, 11, 2017, Cape Fear River Watch office, Wilmington, NC. Kastleman C. Using Participatory Approaches to Engage Communities. Oral presentation to Community-Based Environmental Management graduate students, Nicholas School of the Environment, October 27, 2017, Duke University, Durham, NC. Kastleman C., Luukinen B., Tikalsky E. “Understanding Gardeners’ Exposure to Soil Contaminants and Pesticides in NC.” Oral presentation, North Carolina Community Garden Partners’ Annual Board Meeting, February 2017. North Carolina State University, Raleigh, NC. Luukinen B., Kastleman C. Engaging North Carolinians to Protect Environmental Health. Oral presentation to North Carolina Congressional Staffers during Duke Office of Government Relations tour, November 1, 2017, Duke University, Durham, NC. Shapiro-Garza E., Kastleman C., Luukinen B., Rowland K. Engaging Communities in the Development of a Mapping Tool for Environmental Justice Projects in North Carolina. Poster presentation, North Carolina Environmental Justice Network Summit, October 20, 2017, Whitakers, North Carolina. Shapiro-Garza E., Kastleman C., Luukinen B., Tenorio Fenton S., Tikalsky E., Henson R. Community Engagement to Support Community Gardeners in North Carolina with Reducing Exposure to Soil Contaminants and Pesticides. Poster presentation, National Institute of Environmental Health Sciences (NIEHS) Superfund Research Program Annual Meeting, Dec 6-8, 2017, Philadelphia, PA.